There are two main causes of flashing lights. The most common is called a Vitreous Detachment. Inside the eye, filling the compartment behind the lens up to the retina is a Jell-O like material called the vitreous. When we are young, the vitreous is just like Jell-O in that it is stiff and tends to hold the retina in place. As we get older, sometime beginning around age 45, the vitreous becomes more liquidy. When it becomes liquefied enough, it pulls away from the retina, tugging on it as it does so. This tugging accounts for the flashing lights seen during this process. These flashing lights last for just a split second. Unfortunately, in about one in a hundred cases, this tugging results in a retinal tear that can go on to become a detached retina. If your ophthalmologist can catch the break in the retina early enough, a simple in-office laser can seal down the retina and prevent a detachment from occurring. If we don’t catch it in time, major retinal surgery will be necessary in order to save your eye’s vision and prevent you from going blind. Ophthalmic Migraine. Another source of flashing lights is an ocular migraine. These lights typically last from five to 40 minutes, start out small and grow larger, can have zig-zag edges as well as a shimmering effect. They are typically not followed by a headache. What is happening is that the same process that gives rise to a migraine headache also occurs in an ocular migraine but it occurs deeper in the brain tissue, away from pain receptors and up against the ocular nerves. The spasms that occur inside the brain tissue push on the optic nerves in the brain, causing the lights typically seen by the patient. As long as no other neurological symptoms occur, no further work-up is usually needed. Frequently, ocular migraine patients have a childhood history of bad headaches. 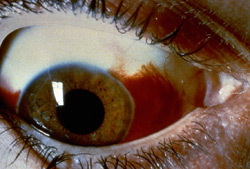 There are many causes of red eyes, one of which is a subconjunctival hemorrhage. Subconjunctival hemorrhages are usually the result of rubbing the eye too hard. A small amount of blood is spread out between two layers of skin around the eye, making the bleeding look much worse than it is. Unless you have a history of subconjunctival hemorrhages, not much else needs to be done. Patients taking aspirin or other blood thinners may get these bleeding episodes more often. Our tears have protein in them. This protein coats the surfaces of soft contact lenses and through time and use, become denatured. In patients that build up alot of the protein or are very sensitive to this denatured buildup, their eyes develop a red eye reaction. This reaction is a response by the cornea to try and fight off this foreign protein and is seen by your Doctor as white blood cells invading the cornea. Clumps of these white blood cells are called sub-epithelial infiltrates and can be seen under high magnification by the Doctor. It is important to realize that sub-epithelial infiltrates are not an infection but their presence does increase your chances for an infection and I will have you use topical antibiotics 4 times a day for 5 days to make sure that an infection does not develop. Just as you would do if you cut your skin. To get rid of the white blood infiltrates, you have to do something that you do not want to do. You have to not wear the soft contact lenses for at least 6 weeks. Strict. It takes this long for the cornea to clear itself of these white blood cells. Then, we have to change your wearing/ cleaning pattern so that you have a cleaner contact lens on your eye for less amount of time. This may involve changing your disinfecting solution to a hydrogen peroxide system like Clear Care, using strong cleaners likeMiraflow or even changing to daily contact lenses, where you throw then away every day. The key concept is that we have to change whatever wearing pattern you were doing that lead up to the reaction, to one that will allow you to get back into soft contact lenses without the reaction coming back. 25 years ago, we had either daily wear soft contact lenses or extended wear contact lenses. All extended wear contact lenses were approved for 30 days of continuous wear. One daily wear contact lens lasted for 12 months and daily wear contact lens lasted for 9 months. We saw alot of sub-epithelial infiltrates and ulcers due to protein build-up on the contact lens and a lack of oxygen getting to the cornea due to the continuous extended wear modality. The cornea gets its oxygen from the atmosphere not from our lungs and blood stream. Because of this, when you put a contact lens on the eye, less oxygen gets to the cornea. Alot less oxygen if you sleep with the contact lens on, since you have a contact lens and the eyelid stopping oxygen from getting to the cornea. (The inner surface of the eyelids actually supply some oxygen to the cornea when our eyes are closed but even this reduced amount is really reduced when we sleep in a contact lens). Less oxygen to the cornea means that the cornea cannot defend itself against attack by diseases. This is why most Doctors do not want you sleeping in contact lenses. What the contact lens companies did to overcome this problem was to mass produce the same soft contact lenses in huge numbers so that we can replace them more frequently (the disposable format was born!) and reduce the protein build-up and infections that we saw so much of. More recently, they have developed more oxygen permeable materials such as the silicone hydrogel soft contact lenses also in the disposable format, which has really helped reduce the incidence of ulcers and sub-epithelial infiltrates. I still see red eye reactions to soft contact lenses due to sub-epithelial infiltrates a fair amount. Most of the time, these sub-epithelial infiltrates have been incorrectly diagnosed as an ulcer. (Ulcers require that an active infection or a break in the corneal epithelium has occured). I see 20 sub-epithelial infiltrate patients to each ulcer patient.